Since it first began tutoring students at Alhambra High School last year, the Grand Canyon University Learning Lounge has been embraced by the campus community — faculty, staff and student tutors. Members of the Shafi family open some of their gifts Monday in GCU’s Learning Lounge. The gifts were provided by staff in the University’s Tempe office complex. On Monday, 15 months to the day after it opened its doors, the Learning Lounge got another big hug. This time, its teenaged clients came on campus, not for free help in reading, writing, math or other subjects, but to receive Christmas gifts from those jolly St. Nicks in the GCU Tempe office complex. Staff in the University’s international, College of Education Mid-Atlantic enrollment and non-degree/single course divisions brought dozens of gifts for three Alhambra students and their 17 family members. The delivery of gifts, including jeans and T-shirts, remote-control cars, roller backpacks and a “Frozen” waffle maker with pancake mix and syrup, came just a day after more than 350 children and their families in the GCU neighborhood visited campus for Canyon Cares Christmas. The annual event, supported by hundreds of faculty and staff members who purchased gifts and volunteered time, provided the guests lunch, crafts and visits to Santa in the Arena on Sunday afternoon. From left, Lillian and Jane Sabuni pose for a selfie with Arlin Guadian, program manager of K-12 Outreach at GCU. Jane, a junior at Alhambra High, and her family were adopted for Christmas by a group of employees in Tempe. Alhambra junior Jane Sabuni and her sister, Lillian, came to the Learning Lounge Monday to receive gifts for their family of nine, which was resettled five years ago to the United States from Tanzania. Sabuni has been tutored at the Learning Lounge since last summer, when she also took a dual-enrollment course in psychology. Having lived for four years in a refugee camp with her family, Sabuni has experienced some rough Christmases, including the year when a younger sister died of illness. This year will be better, the teenager said. The other Alhambra students, sophomore Cyrus McMullen and freshman Fatimah Shafi, who recently moved with her parents and three siblings to Phoenix from Malaysia, also opened several boxes of presents and candy. 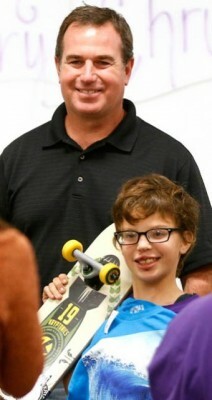 “I really appreciate it,” McMullen said quietly, after opening new wheels for his skateboard, to enrollment counselor Russell Kimbrough. GCU enrollment counselor Russell Kimbrough spearheaded the gift-giving effort. It was Kimbrough’s idea to adopt the Alhambra families, and he worked with Tempe colleagues Susan DeRemer and Kaitlin Neal to get the word out. “The initial idea was you have kids struggling in school going to our tutoring center to get some help, so why don’t we give them a little bit of a reward for taking that initiative for their futures? And why not spread that to include their family members?” Kimbrough said. Dr. Joe Veres, GCU’s director of K-12 Outreach DeRemer, said his office was grateful to Kimbrough and his coworkers for their thoughtfulness and generosity. DeRemer, who goes by “Mama Sue” around the office, said her team responded as it always does. 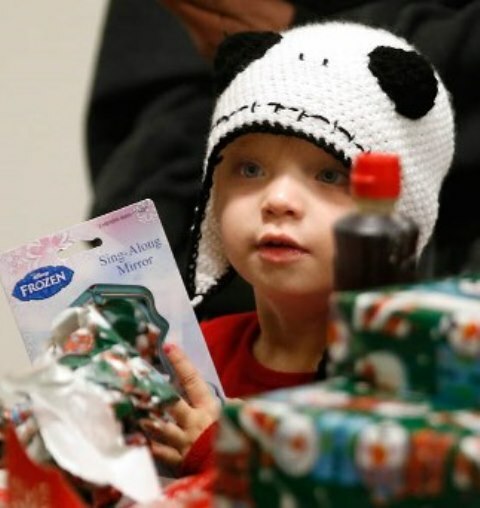 Christmas came early Monday to families of students in GCU’s Learning Lounge. item. In all, 24 gifts and $328 were collected, and each family also was presented with a gift certificate from owner Tony Garcia for dinner at Garcia’s Las Avenidas at 35th Avenue and Thomas Road in Phoenix.